What I’m about to say may gross you out, but I was actually one of those guys who loved Miracle Whip. Yep. I ate many Miracle Whip Sandwiches. You know, just the mayonnaise and bread? Weird huh. I liked Cheeze Whiz too. Must be something in my genes. Now the wife, she was a Hellman’s Real Mayo girl through and through but I didn’t hold that against her. I could (and did) eat that too. But those days are long gone. Mayonnaise today is just too oily and usually contains eggs. Not very vegan, not to mention not very healthy. But every now and again, you run across a recipe where you NEED mayonnaise. Like the homemade potato salad I made for lunch today. Yes, I have tried Veganaise, and no I will not use it – WAY too much fat. No, in these cases you are really left no other choice but to make your own. So that’s what I did. 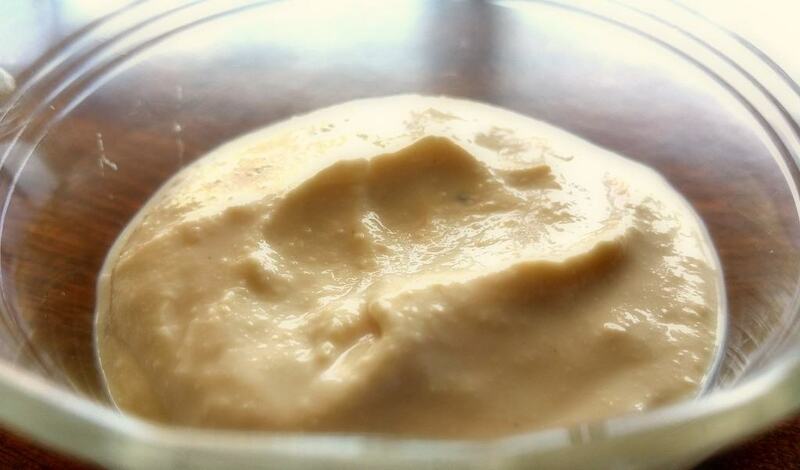 I made mayonnaise and it was AMAZING and it was EASY. All you need is a blender. 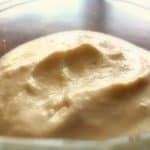 A rich, fat-free Vegan Mayonnaise using Tofu, Lemon Juice, and a few spices that is super easy to make and much, much healthier than store bought. Previous Post: « But Where Do You Get Your ….. Fiber? Most tofu mayos say to use within 1 week.. No way can I eat that much mayo! Any way to store or save for later? Also, any subs for horseradish? Doug, sadly no I have no idea how to store this. So I only make it when I really, really need it. And yes, I too have tossed out some more than once. And horseradish? YUM! That sounds like a challenge, as I love the stuff too. Oh sorry. I thought I was replying to you above. You might want to check my above comment about how to freeze, which I have done successfully with another similar recipe. I’m going to try this, but with white or cannellini beans instead of the tofu. I’m trying to eat really low fat. What do you think? Thanks for all you great recipes. I don’t have horseradish. If there any sub for it or just leave out and hope for the best? Do you use silken tofu with this or the water-packed refrigerated kind? Both kinds come in “extra firm” so I’m not sure what’s best. Can you use beans or cashews instead of tofu? Yep you sure can. I just recently released 2 different recipes with a White Bean Mayo. Look for my Vegan Turkey Salad or my Vegan Potato Salad, they both include it. This sounds good so I can’t wait to try it. I made another recipe (also good) which included tofu and cashews. I can’t remember the other ingredients. But I was able to freeze the leftovers (which I actually froze in numerous small containers to equal the amount I wanted for future chickpea salad recipe) and even thaw slightly in microwave, then reuse leftovers. There was a very slight change in texture but really very subtle. Still tasted great. I’m not sure whether any of your other ingredients would prevent freezing, but it’s definitely worth a try. How is this fat free if it made with tofu? Doesn’t tofu have fat content? Did you find any substitutes for horseradish? The only horseradish I can find all have soy bean oil and egg yolks. Not healthy and not vegan. Any other ideas? You’re looking at Horseradish Sauce. You need to look for pure horseradish. I am a miracle whip girl myself. Trying to make the ole switcheroo. This recipe seems perfect for that. Can’t wait to try. Amazing! Thank you. Just made it and it is so good!